As ride-sharing services Uber and Lyft continue to grow in prominence across the country, new data from YouGov BrandIndex shows that more consumers are willing to consider using the apps than ever before. 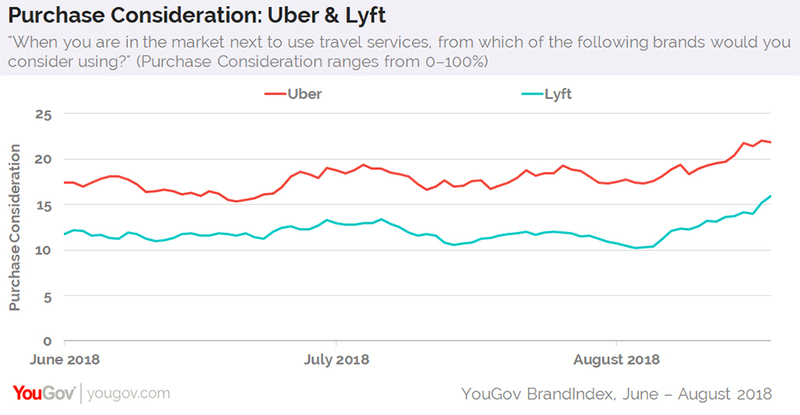 Just a few days ago, Uber's Purchase Consideration score — which gauges how open US adults are to using the brand the next time they need to travel — reached an all-time high of 22%. This indicates that over one in five Americans are receptive to the idea of Uber taking them to their desired destination, whether that be work, a friend’s house, or the airport. Likewise, Lyft’s Purchase Consideration score recently rose to an all-time high of 16%. Additional data suggests that both brands are also experiencing their highest levels of satisfaction among the general American public. Lately, Uber’s Satisfaction score has climbed to 16, while Lyft's has reached 10. 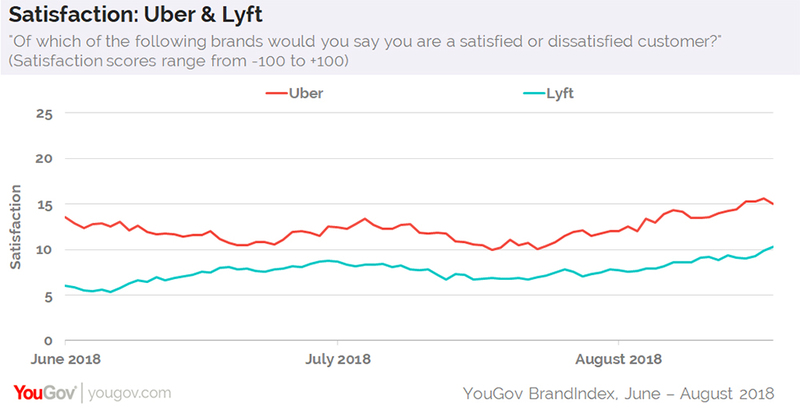 Around this time last year, Uber’s Satisfaction score sat four points lower at 12, while Lyft's was down three points at seven. Numbers from YouGov Profiles reveal that 48% of US consumers who've used Uber in the past 12 months fall between the ages of 18 and 34. The same is true for 54% of Lyft users who’ve used the ride-sharing service in the same period. Current Uber customers are more likely to reside in a suburb (41%) than current Lyft customers (35%), while Lyft customers are more likely to live in a city (49%) than Uber customers (40%). In total, 82% of recent Uber users report owning at least one of the following vehicles: car, truck, van, motorcycle. For recent Lyft users, the rate of owning at least one of the aforementioned vehicles is 71%.